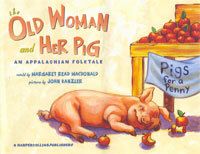 Sweet Appalachian variant of the British tale of the old woman whose pig won't go over the stye. This pig won't cross a bridge, but a caring cat and a moonlit-filled world make all well in the end. After much jogging along and singing, of course.